Just print and go with this easy to use activity! 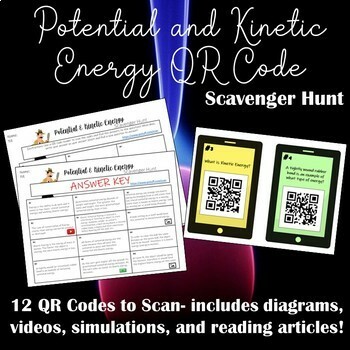 This QR code scavenger hunt leads students through the various aspects of potential and kinetic energy through videos, diagrams, reading articles, and a simulation! The Questions cover the concepts of energy transforming from potential to kinetic, Law of Conservation of Energy, gravitational potential energy, elastic potential energy, energy in a pendulum, energy in a rubber band, and more!